What do I see when I look at the new logo? I see “One World”…”forever” as a message from the New World Order. 1776 is the year that America declared their independence, but it is also the year that the Illuminati was founded, and the Illuminati came first. How well I remember the crystal-clear, cornflower blue sky on the morning of September 11, 2001. It was a perfect day, until the towers fell at the hand of Muslim terrorists. Out of the rubble, slowly arose a defiant new structure called the Freedom Tower, and it was being built to stand at exactly 1,176 feet from stem to stern. Patriots cheered and America got back to business. Then, very quietly, things started to change. Freedom Tower was out. The new name became the One World building. And just so you have it straight in your head, the new name of the building was not changed to “1 World Trade Center”, it was changed to “One World, trade center”. Because that’s how it appears in all the splashy new logos and graphics in their advertisements. It is the One World building, that also happens to be a trade center. But that’s just a name, you say, right? Let’s take a look at what’s under the flashy new facade. In February of 2012, it was reported that the high-tech system of thousands of “intelligent” cameras and computer processors can recognize people’s faces and retinas and then compare that information with databases such as terrorist watch lists, sources said. Security measures at the 16-acre include the sensitive cameras alongside infrared and heat sensors that can be outfitted with explosive and radiation detectors. And agency brass also are authorizing “artificial intelligence” computers that constantly track the behavior of people on the ground — figuring out how to spot “unusual movements” that can be flagged for security personnel. For example, cops could be dispatched if the computers detected someone deviating from the normal walkways or walking against the flow of pedestrians; jumping around or making erratic movements; or dropping a bag where people do not usually leave their luggage. 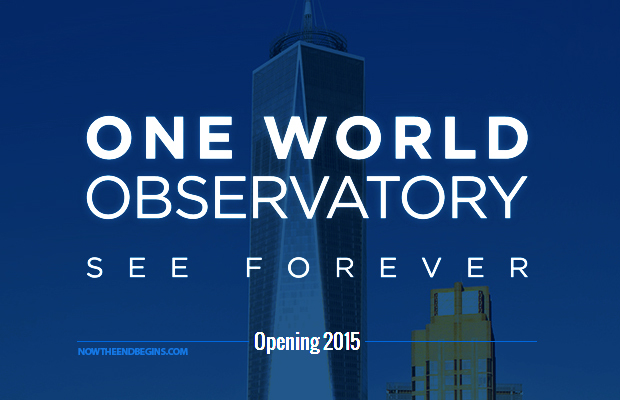 “What we’re doing at the One World building has never been done before,” one agency official said. The agency’s system will be connected to the NYPD’s Lower Manhattan Security Initiative, which has cameras and scanners spread around downtown. The Defense Department contractor Behavioral Recognition Systems, based in Houston, will set up most of the system, which is expected to cost tens of millions of dollars. In other words, the new One World building is meant to be the hub point through which the entire city of Manhattan will be wired for around the clock, hyper-invasive surveillance. When Muslims claim victory in a military conquest, they do two things. They build a mosque on or near the site of the battle, and then they raise up a minaret as high as it will go to show the world that that land has been claimed as an Islamic victory. 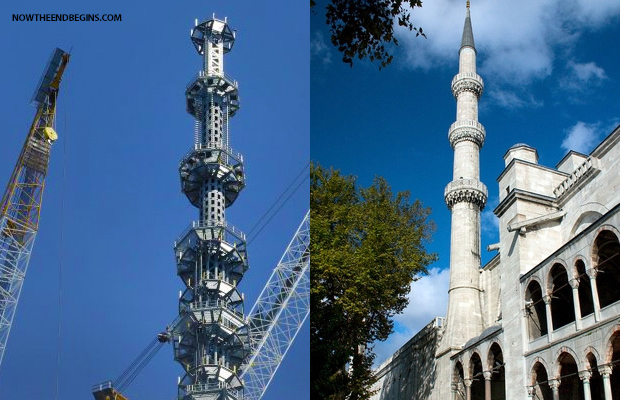 The image on the left is the tower on top of the One World building, and the image on the right a minaret on an Islamic mosque. So what exactly would be the difference between these two structures? I am hard-pressed to discern between the two. They attempted to also build a huge mega-mosque right near the Ground Zero site as well, but were defeated by the efforts of our friend Pamela Geller from Atlas Shrugs. But, as you can see, raising the minarets was completely successful. 1776 is the year that America declared their independence, but it is also the year that the Illuminati was founded as well. In fact, the Illuminati’s creation on May 1st predates America’s founding by nearly 9 weeks. If they would have kept the original name of Freedom Tower, as it was supposed to be called, then that would be a great and patriotic match to the year 1776. But with the name change to the One World building, I have to believe that 1776 is indeed a reference to the founding of the Illuminati. Just as the New World Order decided to put the headquarters of the Luciferian organization known as the United Nations in New York City, they have also decided to put the central command center for the coming One Word Government in New York City as well. The One World building, which could aptly be called America’s Pyramid, is a collection of Illuminati triangles from any angle you look at it from, including from an aerial view at the very top. And lastly, however you choose to believe that the Twin Towers were brought down, one thing is for certain. What arose from the rubble in the aftermath was a scary new world that is on 24 x 7 digital lockdown, with never-ending global wars, and open terrorist attacks in every major city in America. Police departments are all being militarized with battlefield tanks, and the uniform of the average policeman looks like a cyborg from a video game. Government-funded race riots break out every few months, attempting to provoke a new civil war. A lot more than people died on 9-11, freedom died that day as well, as the Patriot Act, the Utah Data Center, and the Department of Homeland Security will attest to.